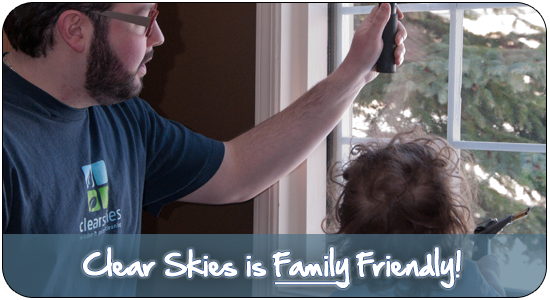 Welcome to the friendly page for Clearskies Window Cleaning – Edmonton’s (and possibly the World’s) friendliest window cleaners! Along with my family, I grew up right here in Edmonton, and like many Edmontonians, I’ve learned to love both the bright and beautiful winter (how is that possible, right? ), and adore the luxuriously warm Summers, too. Oh – and of course, I cheer for the Oilers. That’s a given. What’s the story behind Clearskies Window & Gutter Cleaning? I started Clearskies back in 2008, and every year since then, our client base has continued to expand as demand for our services has increased. From the beginning, what we’ve heard from our clients over and over again is how much they appreciate our friendly disposition, pleasant conversation, and warm smiles from our crew. I would like to express my appreciation for the services ClearSkies has provided to me and my family. The whole experience, from initial estimate, through first visit, follow up and after care have been exemplary. I would and will strongly recommend ClearSkies to my family, friends, neighbours and others! My wife said it best when we looked out of our front windows “We should have had this done months ago! They did a much better job than we could have ever done, and so much quicker.” A very efficient and hard working team was in and out of our house leaving behind nothing but clean windows and free flowing gutters. Again, thank you Seth and ClearSkies! – Paul Onderwater from Laurier Heights, Edmonton. Client since 2010. Referred by a friend. Life is getting harder for everyone, including you. We figured that one of the best things we could do is add a little more friendliness, and a little more sunshine to your hectic and stressful life. Don’t you deserve a little more friendliness? Life is too short not to love your window cleaner! As a result, our entire Clear Skies crew is focused on delivering the easiest, most pleasant, sincerely friendly professionalism in the window cleaning industry. Anyone company can clean a window. But not any company can truly care about making your day feel better. Whether it’s taking extra precautions to protect your valuable possessions (home-friendly), or cleaning your little son or daughters bedroom windows first, so they can lie down for their afternoon nap (family-friendly), the Clearskies crew works hard to make your life a little easier and brighter every single Spring and Fall that you have us come clean your windows and gutters. 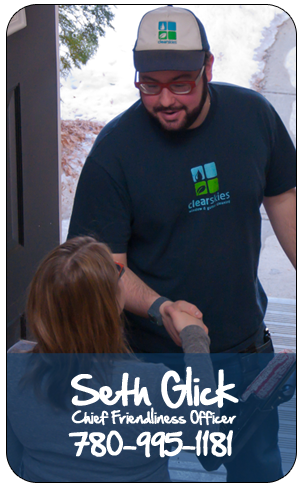 Seth and his crew must be commended on their professional approach to customer service. They were on time, thorough in their work, quick and efficient. I will gladly recommend them to family and friends. Why not call or text 780.995.1181 right now, and find out for yourself how we can add a little more friendliness to your life? I highly recommend clearskies residential cleaning Inc. to any one interested in having clean windows. After the service I fell in love with my windows. It feels as if I am living outdoors. The windows actually sparkle and even my neighbours noticed that my windows look exceptionally bright, shiny and clean. My house looks alive and was lifted up as a result. I also very much appreciated the friendly approach of staff and the way by which the whole contact and delivery of service was done. Most professional, I’d say. Thanks again and I will definitely have this company back late Fall and next Spring. –Elisabeth Bodner from Edmonton, Client since 2010. Found us on Google. Why not call or text 780.995.1811 right now, and find out for yourself why more and more homeowners like you are switching to Clearskies for their professional window cleaning needs?